Sinking into the blue velvet settees in Le Hall, one imagines the events of previous centuries that transpired here. As much as the Baur au Lac has a storied past, the hotel has kept up with modern conveniences. 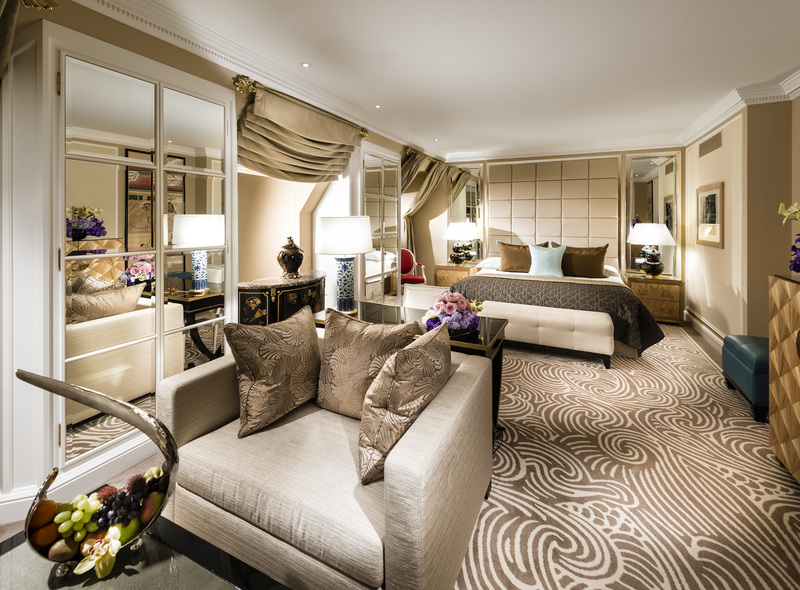 Baur au Lac is classic elegance, with luxurious rooms of subdued colours. The white marble bathrooms are large for hotels of this epoch and the bath towels are overly plush and oversized. While following the finest of traditions, Baur au Lac partakes in seasonal events throughout the year. Dining at Pavillon, the Michelin-starred restaurant, is haute French cuisine precision by chef Laurent Eperon. 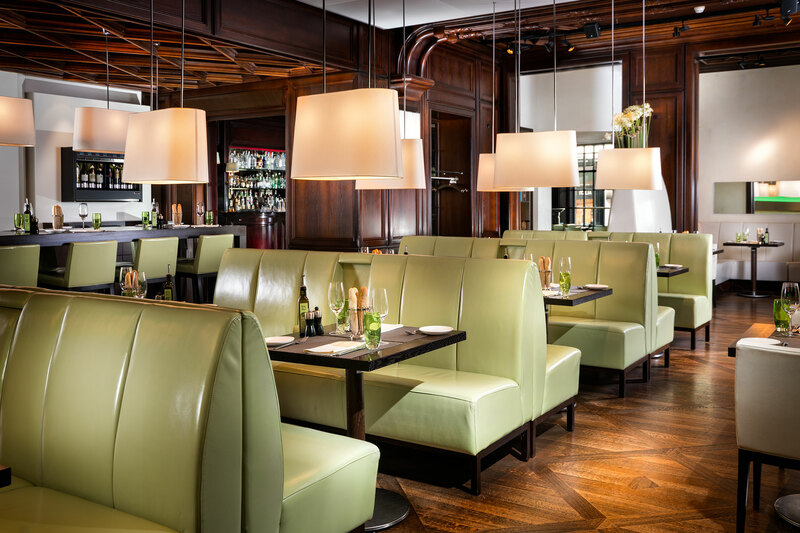 Rive Gauche’s green-apple leather banquettes are oft occupied with a sophisticated business set for lunch. 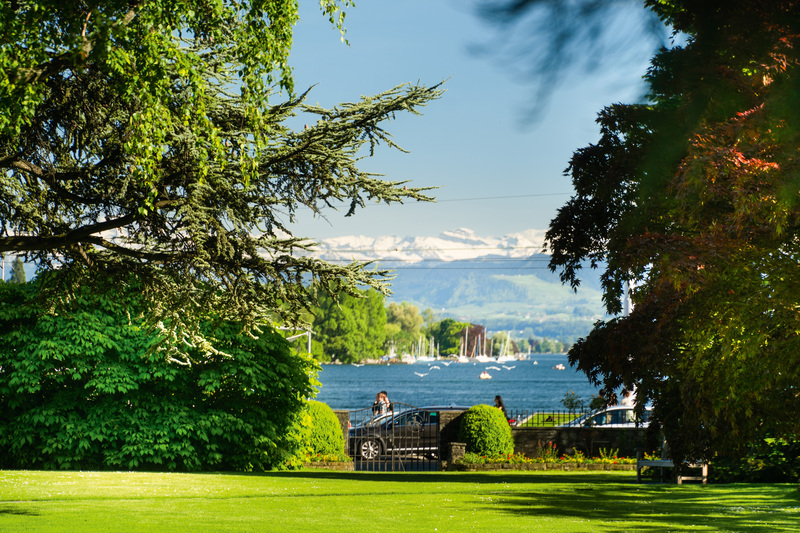 Baur au Lac is located on the shores of Lake Zurich facing the snow-capped Alps beyond. The neo-classical façade hints at the old fashioned glamour that awaits inside. 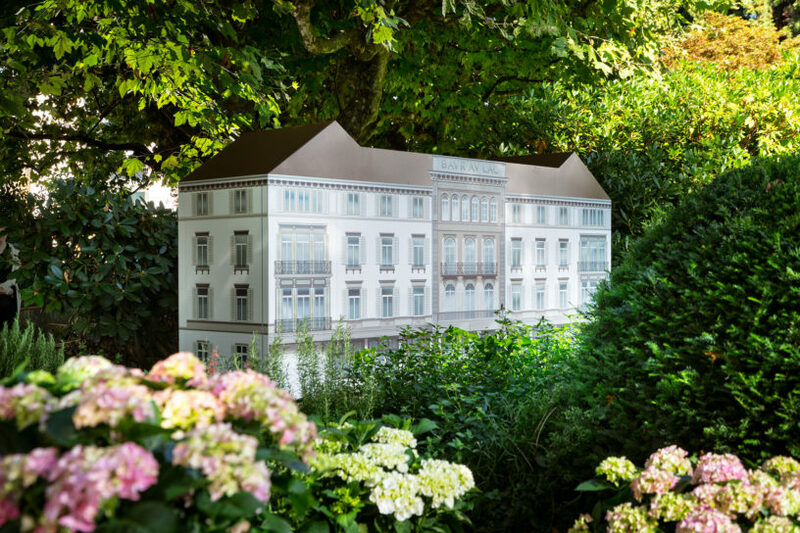 The grande dame presiding at Talstrasse 1 in Zurich is of certain splendour. 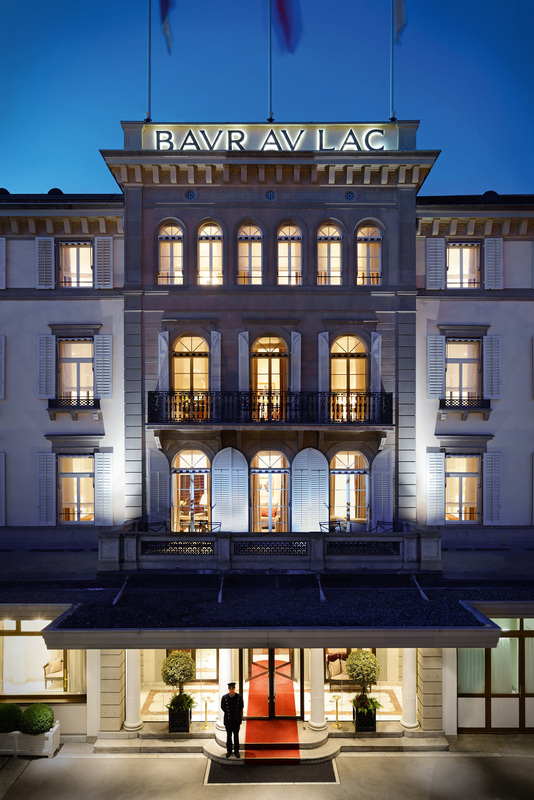 Baur au Lac, as she is called, is located on the shores of Lake Zurich facing the snow-capped Alps beyond. The hotel has been in the hands of the same family—the Baurs, later by marriage the Krachts—since it was founded in 1844. The neo-classical façade hints at the old fashioned glamour that awaits inside, where kings and queens have rubbed shoulders with composers, artists, and silver screen stars. Baur au Lac is where Richard Wagner first performed The Valkyrie, accompanied by Franz Liszt on the piano; where Alfred Nobel was inspired with the idea for his peace prize; and where Walt Disney gave out handsome tips. In his suite at the Baur au Lac, Marc Chagall—known to spend long periods at the hotel—worked on his drawings for the stained glass windows at the Fraumünster church. In his frenzy of creation, paint would spatter everywhere and, each time Chagall left, the carpet was so stained that it had to be replaced. Vignettes of art appear in the Baur au Lac guest books as well. Leaf through the volumes and you’ll see a pair of eyes and heart as drawn by Joan Miró, and a black pant suit sketched by Yves Saint Laurent. As much as the Baur au Lac has a storied past, the hotel has kept up with modern conveniences with in-room iPads the most recent amenity addition. And while you may use the tablet to request that item you forgot to pack—sleep mask, phone charger, book—a suited squire will bring one or all to you on a silver tray. 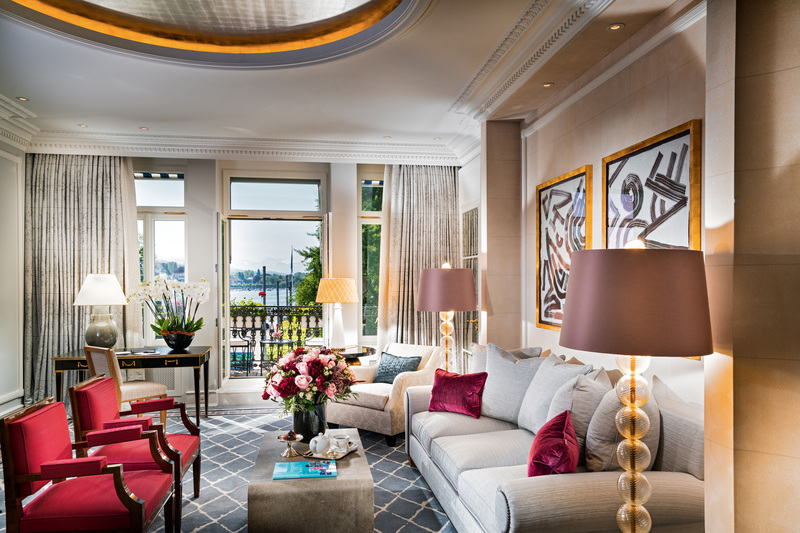 Baur au Lac is classic elegance—hanging tapestries, oil paintings, giant chandeliers—with the 119 luxurious rooms of subdued colours, carpeted in taupe and off-whites, and voluminous window coverings with reams of silk taffeta. 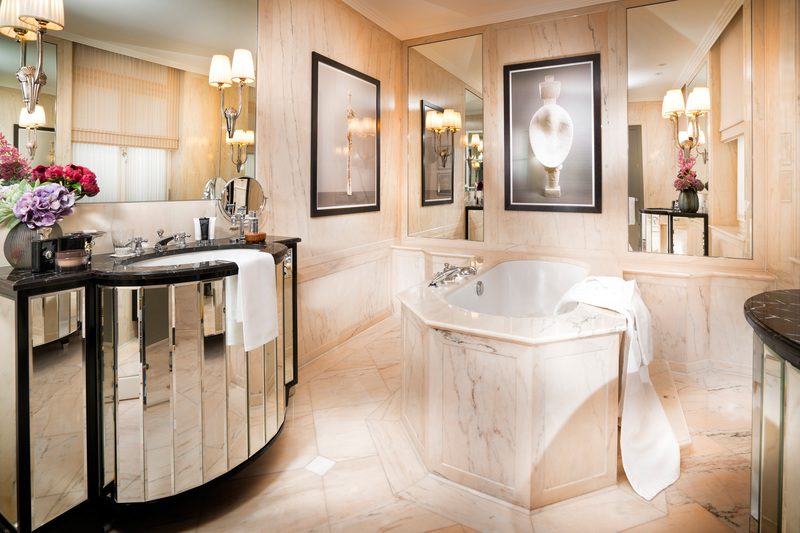 The white marble bathrooms are large for hotels of this epoch and the bath towels are overly plush and oversized. Three in-house florists take care of the floral arrangements daily and there is one full-time mechanic to keep the hotel’s automotive fleet, which includes a Rolls-Royce Phantom, in fine form. 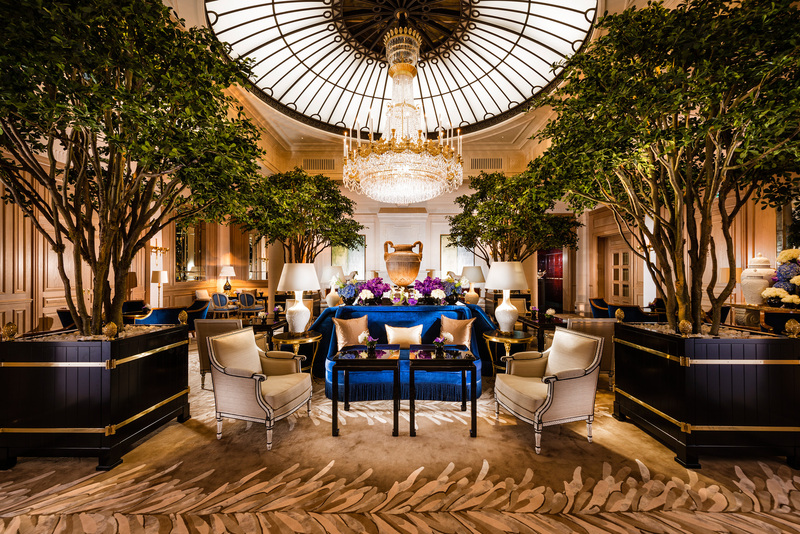 Sinking into the blue velvet settees in Le Hall, as the hotel lobby is called, with the most regal of Lalique chandeliers overhead and an oil painting of hotel founder Johannes Baur taking up one wall’s real estate, one imagines the events of previous centuries that transpired here. Dining at Pavillon, the Michelin-starred restaurant, is haute French cuisine precision by chef Laurent Eperon. 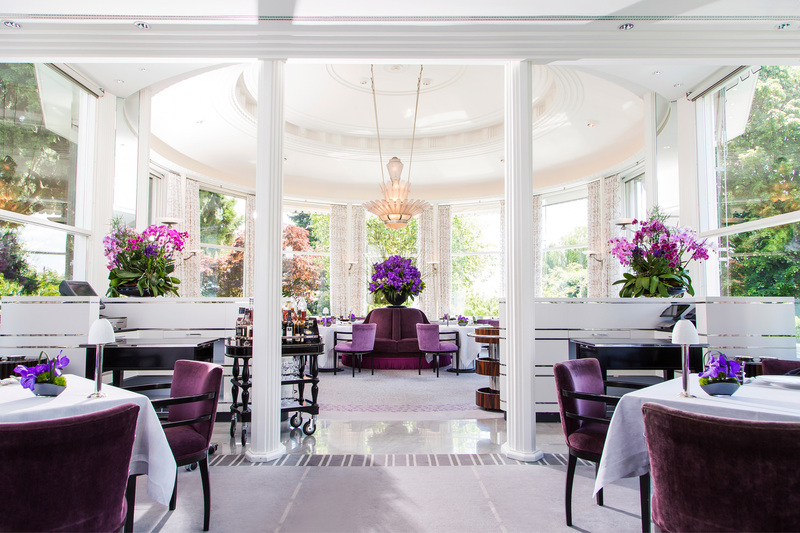 Its location in a glass rotunda offers 360-degree views and floods with natural light, art deco influences, and a lesson in designing with the colour purple, as done by Pierre-Yves Rochon. Rive Gauche is a stark contemporary contrast of casual dining with green-apple leather banquettes that are occupied with a sophisticated business set for lunch (Zurich is Europe’s banking capital). The hotel’s apiary, Bee au Lac. While following the finest of traditions, Baur au Lac partakes in seasonal events throughout the year. Boum Boum au Lac is a well-heeled garden party for the annual techno music event in Zurich during the summer and come December, a traditional mountain-chalet-style Chalet au Lac is built on the grounds where guests get cozy and delight in fondue and raclette. As well, Baur au Lac may have the world’s only five-star bee hive, where a colony of over 80,000 bees are in residence. Bee au Lac, a miniature replica of the hotel, houses Apis mellifera bees collecting nectar and pollen on property for the hotel-made honey. 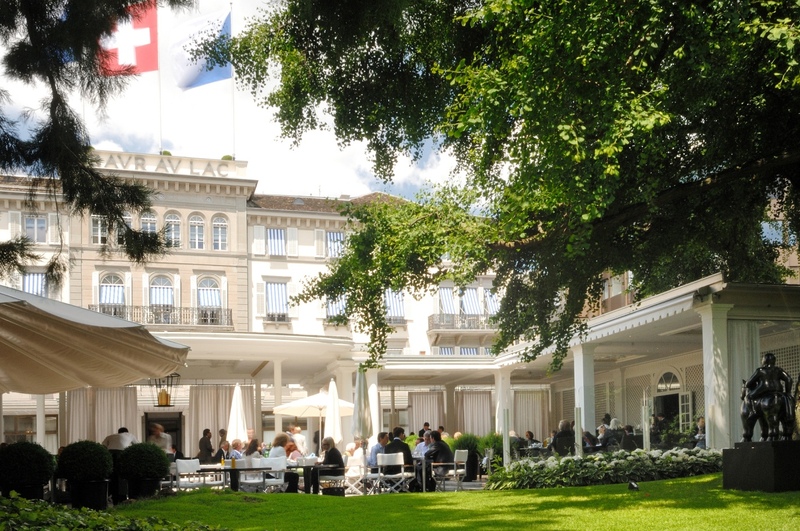 Baur au Lac is very much rooted in familial ties and continues to be a grand hotel of Swiss hospitality.